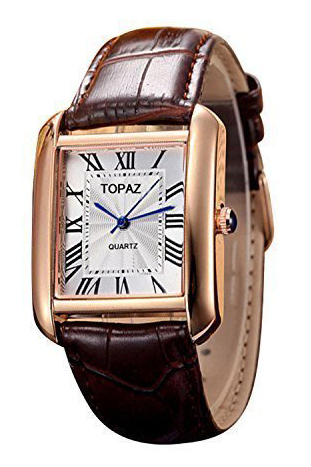 The Topaz Unisex White Face watch is very fashionable for either men or women. Its modern design is classic. I love the roman numerals. The strap is made of genuine brown leather and very comfortable. The watch is water resistant and will withstand rain or splashes of water. This watch would make a great gift and comes with a two-year warranty. 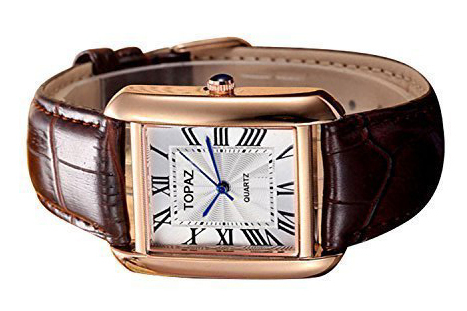 Luxury Fashion unisex watch with classic design. Engineered with a state-of-the-art quartz technology movement shows precise time and date. Stainless Steel case that makes it extremely durable. Great watch for those that need an everyday use timepiece that will withstand the wear and tear. Rectangle Designers dress watch with logo on dial. Beautiful companion with CLASSIC DESIGN at Super Low Price. Brown leather with stainless steel case and Rose Gold Index Numbers. JAPAN quartz movement with Genuine Leather Band. WATER RESISTANT to 99 feet (30M). Withstands rain and splashes of Water but not for showering or swimming.